Gentle bimbling from the Picos via some of the Cordella Cantabrica mountains and flooded valleys brought us to the road to León, and in to the city for late afternoon. After finding the dedicated overnight campervan parking area (a corner of a car park on the edge of the city centre – with handy shopping mall with great loos), we started to wander through the city. If you buy drinks in a bar in León, you automatically get free Tapas. It’s just the way they do things. Very civilised. The food varies from bar to bar, some you get a choice, some you don’t. Who are we to say no to that? We ended up not buying dinner, but still feeling very well fed. At €1.50-€2 per glass of Rioja, we bar-hopped our way round the old town – munchies partaken of ranged from hams and sausage on bread, via fried potatoes with garlic mayo, to hot battered calamari. León has been our first encounter with the main Camino de Santiago – and there were plenty of pilgrims in the old town. On foot, on bike (none on horseback that we’ve seen so far), they included a group of about a dozen lads from Pennsylvania – who were repaying the hospitality shown to them by the towns they visit by singing and putting on shows of circus skills throughout the towns of an evening. 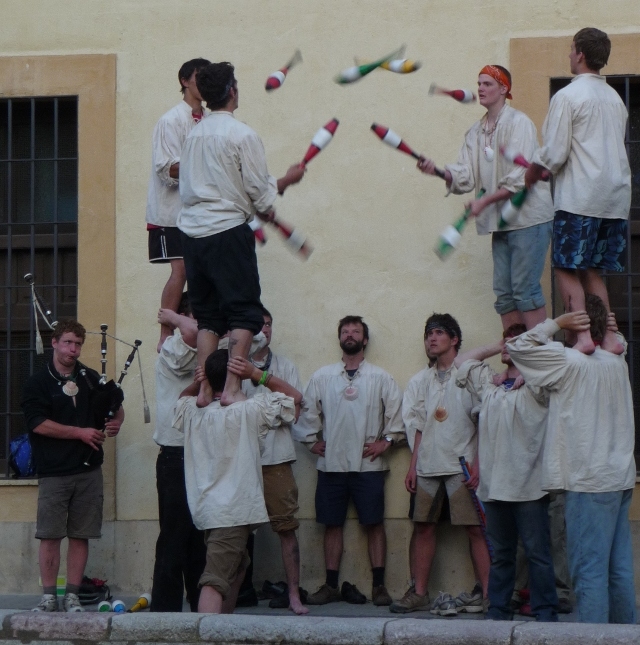 We saw them in one of the quieter squares – sea-shanties to the strains of the bagpipes, and juggling clubs between four of them stood on the shoulders of the others. We also saw them along the road, then later in Santiago itself – grubby but unbowed. Guys, in the unlikely event you read this, we salute you. León itself is a wonderful city to spend some time – as well as the main cathedral, the basilica of San Isidoro, with the Pantheon of the Kings of León, was very well worth a visit. 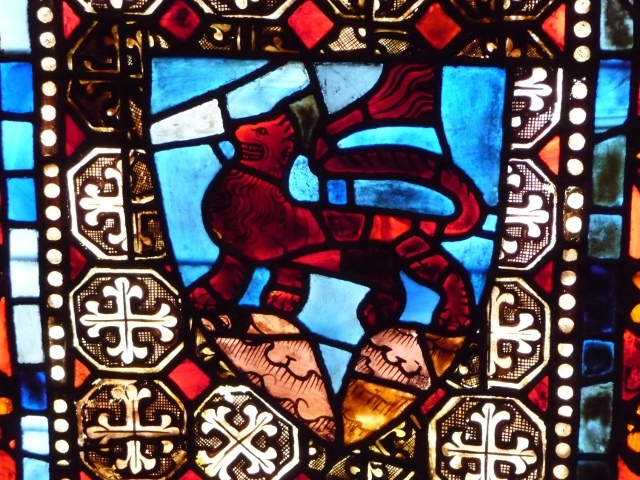 The cathedral itself is home to one of the most extensive collections of stained glass windows – much of it being restored at the moment. As part of that restoration, there’s access to a platform 16m up in the cathedral nose-to-nose with some of the glass. The workmanship that went in to the windows belies the fact that the original craftsman would have no expectations of any person but them ever seeing their work close up. This entry was posted in Art & Culture stuff, By Country - Spain, Food stuff, Travel stuff. Bookmark the permalink.